Why you might ask? Because she's awesome, she cooks with real butter, makes mistakes, and has a unique voice Daniel calls "like Ms. Piggy". It all started when I watched Julie & Julia with my in-laws when Daniel was out of town about a month ago. 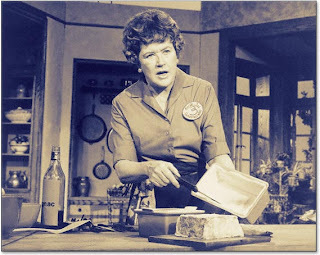 I loved the movie and wanted to know more about the queen of cooking. Previously all I knew was she was a really old woman with a cooking show on PBS. Also her cookbooks were very highly esteemed, and were tops for having working recipes. What other type would a cookbook have? Well unfortunately many cookbooks are published with recipes that don't work, ever cooked something that didn't turn out and you really followed the recipe? Well it may not have been your fault. But Julia was always very careful about having cookbooks with very carefully tested recipes. I don't have her classic Mastering the Art of French Cooking yet. I'm hoping my Valentine might give me the set in hopes I'll make him a yummy meal. Why in the world would I be interested in some from scratch, possibly complicated recipes now? Because I love to cook. Some of my favorite pre-Simeon times were making delicious meals for my hard working husband to come home to. And I will have the opportunity to teach Simeon about food in the years to come. Being we are home together all day and we don't have a TV, we'll need some activities. Seriously the boy is really active and is going to need some constructive outlets.